Bouncing Buttons crafts making it simple: Snap happy! A table full of fitted diapers all WITH snaps! I am getting very excited about having this baby and getting to try out all my diapers! 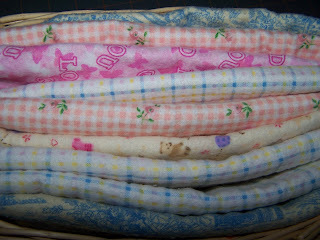 A basket of burp cloths. Tomorrow if I get computer time I will try to post the story and pictures of my big sewing mess ups! I laugh just thinking about it. I made some HUGE mistakes! My mistakes are not on baby things it was on something else but it is a very funny story. I have no excuse for how it all happened except for being able to say my prego head doesn't think anymore. I guess this baby is sucking what little thinking ability I had right out of me. I wanted to make something for my Mom's birthday. 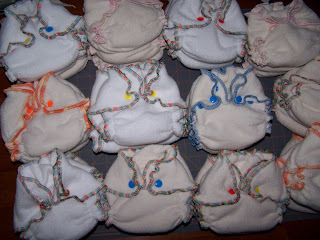 baby sewing wet bags and cloth wipes. I am a sewing nut!